The most recognizable and famous pair is that of Swedes Anna Haag (an Olympic Champion) and Emil Joensson (3-time World Sprint Cup winner). Last summer, at Haag’s birthday, Joensson proposed to her, and she agreed. The wedding will take place the next year, after the Olympic Games in South Korea, because the 2017/18 season will be very tough and important. Anna and Emil have been together since 2008. Now they live in their own house in Oestersund. One of the best world skiers, Russian Sergey Ustiugov, is also in a relationship with his teammate, Elena Soboleva. They met in a junior national team and now both compete at the FIS World Cup and other important international tournaments. Soboleva is a medalist of National Championship; in the World Cup, she fell in the top 10. Upon Ustiugov’s victorious Tour de Ski, Elena had a birthday, but was angry with Sergey – he hadn’t congratulated her live on air on a Russian TV channel. Of course, later they reconciled. Another pair is found in sprinter Federico Pellegrino and his Italian girlfriend Greta Laurent, who also prefers short distances. Her best place in the main tournaments is in 26th place in Sochi. At the World Cup, Laurent was 9th in Team Sprint. At Lahti-2017, where Pellegrino won his principal race, Laurent placed only 29th, but she stayed in the stadium and supported her boyfriend very loudly. There are also international alliances, such as Canadian World Champion Devon Kershaw and Norwegian Kristin Stoermer Steira, an Olympic Champion and WCH-winner as well. Their companionship started in the public eye: on Twitter. Kershaw and his friend Alex Harvey often conversed with Steira and her roommate Marthe Kristoffersen. Then, a few years after, Kershaw and Steira got married. Now they are happy parents of their daughter, Asta Isabelle, born in January 2017. Swedish/Norwegian relationships are the objects of many jokes and anecdotes. While Stina Nilsson and Emil Iversen say they’re just friends, the foremost Scandinavian duet is Norwegian Laila Kveli and Swedish Jerry Ahrlin. Both of them are quite successful marathon-skiers: Kveli is a 3-time Vasaloppet-winner, while Ahrlin was thrice in first place at Marcialonga. After 2016/17 season, Jerry decided to finish his pro-skier career, maybe to make it simpler to take care of their two children – 6 y.o Ebba and 1 y.o. Ellie. 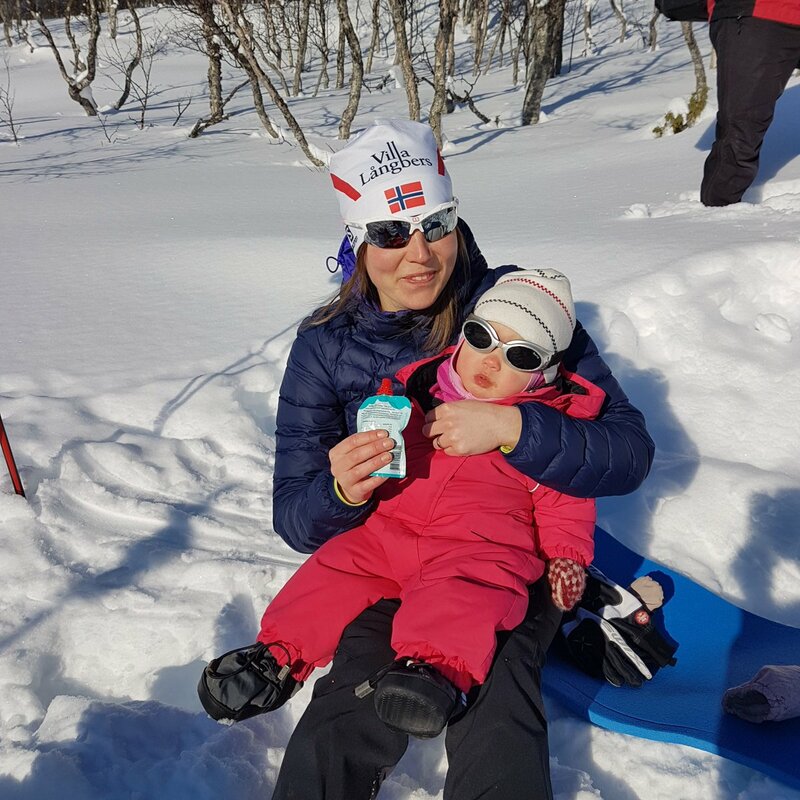 Last season, the parents took Ellie with them, and Laila breastfed her before the marathons.